So week 2 starts with a scrum and then a review of the previous weeks homework. I was lucky to have 3 hours of quiet time on the train back to Aberdeen on the Friday where I managed to get the bulk of the homework done. It did make me laugh that Jamie my son (age 8) and I were both finishing our homework in the kitchen on the Saturday evening. 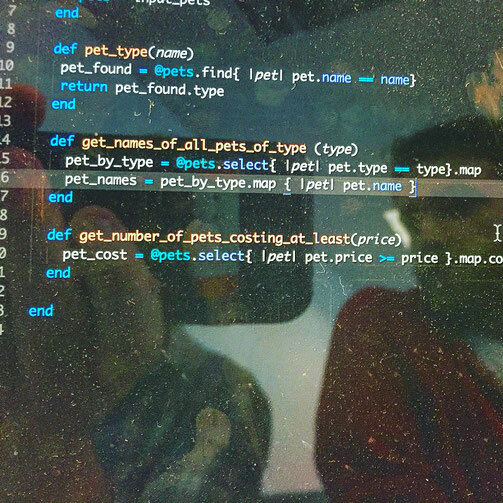 Jamie had grammar and reading and I was making a fantasy model pet shop using Test Driven Development (TDD). Monday saw us learning about cats, wizards and wands to model classes and multiple classes... No wait, thats the other way round. The homework was to continue with classes and model a speedy car (with turbo) and a slow car (non turbo, Normally Aspirated). The type of engine would affect the cars performance and fuel economy which would be passed into the car object. Tuesday was a brilliant day of coding along with an instructor to form a "simple" snakes and ladders game. 21 cohorts clattering away at the keyboard churning out ruby code. The game of snakes and ladders turns out to be quite complicated if you break it down into a program. Thankfully Object Oriented Programming (OOP) simplified it into objects, board, players, dice etc. Wednesday, following the scrum was a whole day exercise where we were split into pairs and tasked with making our own objects and having them interact with each other. The world was our oyster, so as a team we decided to put the band back together and form band related objects including, songs, venues and gigs. It can get very complicated very quickly but we met the brief of having objects interact with each other. Friday is revision and a chance to go over anything we need a refresher on from the week. Oh and we get issued the weekend homework challenge.